The victim of a "suspicious" fire which ripped through a south London townhouse has been named as 46-year-old Memunatu Warne. 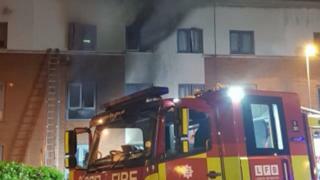 The blaze broke out in the early hours of Thursday at a three-storey property in Centurion Square, Woolwich. A post-mortem examination on Ms Warne gave the cause of death as smoke inhalation. A man in his 60s and a woman in her 50s managed to escape, the police said. Both were taken to hospital where their conditions are described as "serious but stable", according to the Metropolitan Police. Residents said they were woken by a loud bang at about 01:00 BST before flames took hold. Up to 60 firefighters tackled the blaze, which prompted more than 20 emergency calls. A Scotland Yard spokesman confirmed the fire was being treated as arson. An investigation is under way into the cause of the Woolwich blaze, which was brought under control by 03:15 BST, London Fire Brigade said. The force is appealing for witnesses.